This is Bo. That is his nickname and it's short for Bodacious. He looks like a goat but some of us think he is a dog. Bo will agree, I hope, when he is older. Edit: I know some of you are going to think I'm warped. I view that fact with some degree of satisfaction and concur. However, I'm not the only one. I ran across this the other day: http://www.darngoodfarm.com/photos-moose.html Hope you enjoy. For some time I have wanted a dairy goat. Bo is not a dairy goat. He is the right breed but the wrong gender. Bo is the opportunity to manage a small flock (possibly just one) of diary goats more easily. The lady at Calico Dairy sells the boys when her flock starts giving birth. She offered to sell me one at a decent price with some added features. Those features were that she would wean the goat which is a four month process, remove his horns and neuter him. I told her I only wanted about half of the features. I wanted him to keep his horns and I wanted to wean him the last two months. We should get him in about 5-6 weeks. A neutered male goat (or sheep) is called a wether. They have good dispositions and are neutered as much for that as to prevent a population explosion. Having multiple donkey jacks or multiple billy goats would give exactly the same results. Bickering and chaos. With our ducks, I have seen serious injuries when romance is in the air. 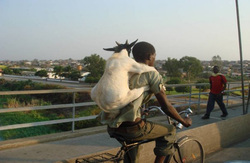 Google says that the lifespan of a Nubian goat is 10-15 years but that some have lived to 24 years. Males grow to approximately 175 lbs. This link is interesting. http://en.wikipedia.org/wiki/Anglo-Nubian . For some reason links must frequently be copied and pasted to your browser. This is Bo's father. He is about 130 lbs at eleven months. Bo is the spitting image of his dad. This is his Dad again. If you go back to the picture of Bo, you will see that even the white spot on his head is similar. My plan is quite simple. Bo is going to be a pet and he will be raised with dogs (Bob in particular) I think it will take a very short time before he is unintimidated by dogs. I am leaving his horns intact for that very reason. I will provide him with a pen in case I am wrong. I saw two of our dogs kill our sheep. Bo is, I hope, going to make the odds better. 175 lbs of upset horned goat should be some sort of deterrent to the neighborhood canines. Further, I intend for Bo and Bob to be walked together. May have to get them matching badges. Between the donkeys and Bob, the only recent problems we have had with other dogs has been in the front yard/driveway. These two are full brothers. I was going to take the one on the right because it was colored so differently.When Sally and I saw them together we changed our minds and took Bo. Edit: On the third of May, the Lady (Mrs. Hoffman) made me an offer I couldn't refuse. We are now getting both these boys. Updated pictures of both in the slideshow. Blondie here at the Suggestion of Miss Sally will be named Jack. Bo and Jack. Goats are trained to do a batch of things and as far as I know they have a pretty uniform intelligence. Some breeds of dogs seem to be bred for intelligence but, so far as I can tell, a goat is a goat. The guys are getting much bigger and tomorrow is time to take them home. Bigger covers a lot of ground and I don't know how big. They have become very curious and affectionate. I'm looking forward to this with a little bit of apprehension and a lot of anticipation. It should be fun but it won't all go smoothly. 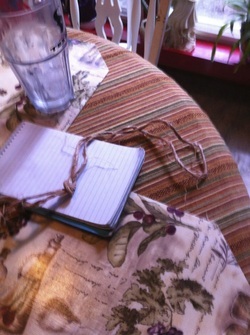 The knot in this twine measures the length to go around their neck. Not the loop in the end. That would hold them both. Most of us took the ride home from the Hospital in something. I say most of us because i was born in a farmhouse so no transit was needed. Bo and Jack will go home in the back of a Toyota. 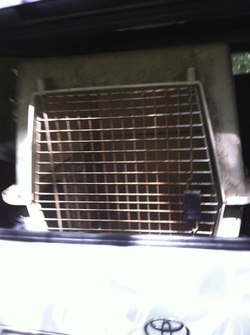 This Toyota will have semiprivate accommodations in the form of a carrier/crate we bought for a rottweiler. I would guess them to be 20-30 pounds apiece. The rott. weighed 80 at least. This will be big enough. When I visited them today I took bob. He stayed in the truck but he didn't bark. Bunches of horse, cattle, and goats. He was off his home turf and I think he just became overwhelmed. Not barking at the goats is something he will have to learn. The pole you almost see in the lower left corner of the picture is where we tie Bob. I have never known him to be mean to the animals even when the male ducks start fighting. He just bowls at them and knocks them all over the place. That makes them forget they were fighting. If he wants to chase these new kids I have a couple months before I set them loose from this nursery. What I would be afraid of is setting them loose with the Donkeys. Even though Donkeys will protect them when there is a strange predator a young donkey can hurt of kill a baby goat while evidently intending to play. 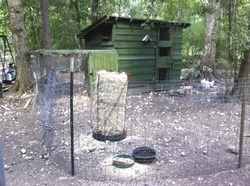 Just last week the chickens got all fired up and Bob started barking. I saw something that looked like this gliding across my back yard. I set Bob after him but he couldn't catch him because of the fences. Most notable though was that the racehorse quick Llama was right on his tail and the donkeys were not far behind. It's way different than when we had the sheep and I like these little guy's chances. At 170lbs I don't think they need protection from a fox but do for a Coyote or stray dog. Miscellaneous goat stuff: I throw these in just because they are so strange and interesting (to me, at least). I am pretty sure the goat has been tied on and is being transported. I don't see how it could be done by training in the absence of any thumbs. 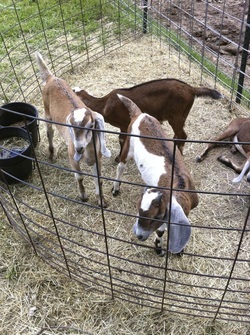 Here are some images of goats being routinely used for tasks. 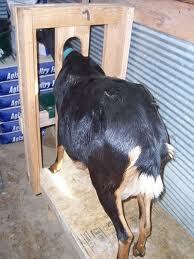 This is the most common task of a Nubian goat. She is in a milking stock. They normally load themselves into this stock (especially when there is grain there) and wait patiently to be milked. Bo will never be here unless he finds himself beset by curiosity. I do intend for him to have a companion who does this for a living. 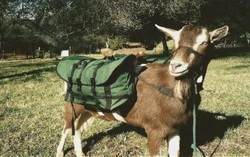 If you do an advanced image search on Google you can find rows of these critters carrying packs. They just march on in a column following their human. They are a lot less stubborn than a Donkey. Another thing that goats and donkeys both do. The donkey can handle a little larger plow but, as said before, they are stubborn. 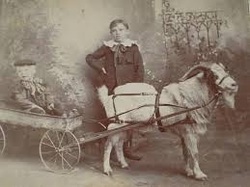 Apparently they have been pulling a cart just about as long as there has been photography. 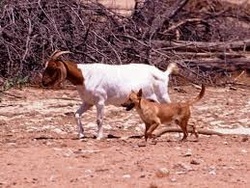 Goats and dogs do bond. Just have to work at it possibly. My hope is that it just happens naturally. We will be taking pictures as Bo grows. I intend to start a slide show and will tell our Facebook friends when we update. Just come to this blog and see what's new. I think this might just be fun. We love having pets and nobody has ever accused us of moderation in that.